Deborah Hicks Odgers (painting as D. Hicks) paints large-scale oil and mixed media paintings in brilliant color. Her work has achieved popular acclaim for her bold style and diverse subject matter exhibiting a range of emotion and statement. She paints beyond convention employing techniques that best convey the message of her subject. 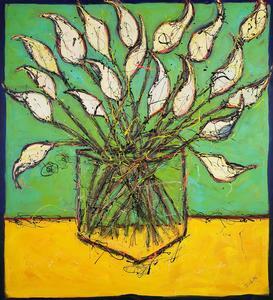 Her bold use of color and often dramatic use of size and form enhance the impact of her paintings. Because she is "unafraid to step out of the norm" to produce work of unique and unconventional style, she feels uninhibited to express herself artistically. As such, she is often regarded as an "avant garde" painter. Her work reminds us that nature courses all around us - messy, malleable, shape-shifting and strange-surprising us with moments of beauty and wonder. Reminding us of our humble beginnings and infinite possibilities. With subtle codes of meaning and grand, large gestures of color and abstraction, Deborah's works baptize the viewer in waves of sound, fury and life at its messiest and most enduring.